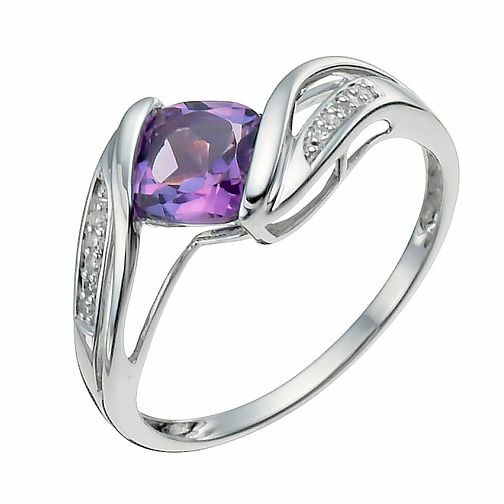 A stunning amethyst set between the arms of a shaped, 9ct white gold ring adorned with sparkling diamond embellishment. A fresh, contemporary approach to diamond jewellery. 9ct white gold amethyst & diamond fancy ring is rated 4.2 out of 5 by 5. Rated 5 out of 5 by Anonymous from Beautiful ring I bought this ring as a birthday present from my parents. Having looked unsuccessfully in jewellers on the high street I found this ring on Ernest Jones web site. The design of the ring is elegant and I love the colour of the stone. The sizing is perfect and suits my hand beautifully. I found the shopping experience online to be very easy through the whole buying process; and delivery was quick and efficient. I highly recommend this ring and believe it is very good value for money. Rated 5 out of 5 by Anonymous from Eye catching with lovely setting Delighted with this ring. The setting is stylish and the stone is a beautiful colour.